East Anglia already has a strong emerging movement of sustainable community food including several horticultural projects, community supported agriculture (CSA) and community gardens providing local produce and opportunities for people to get involved with where their food comes from. 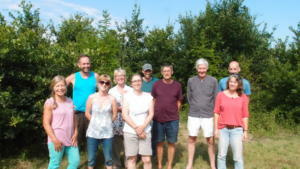 Representatives from several of these inspiring projects came together at the Greengrow Co-op on 22 July to learn more about integrating seed production into their work. Many of the twelve participants already had some experience of saving seeds for their own use, with an impressive 20 varieties of seed already being grown amongst the group. Other experienced growers were looking to gain knowledge of how they could integrate seed production into their existing systems. Hans Steenbergen, of the Seed Co-operative, presented the basic principles of seed saving as well as covering the specifics of producing lettuce seed in some detail. Despite a hot day in an outdoor classroom, participants were engaged and eager to learn more with one participant commenting the workshop was “very informative and inspirational”. Discussion was also held around ideas for future seed related activities in the region including starting conversations on setting up a Seed Circle, organising skill sharing visits to farms already producing seed crops in the area, and visiting the Seed Co-operative’s Open Day in September. If you’d like to learn more or get involved, please contact Eastern England Regional Coordinator Page Dykstra (page@gaianet.org).